Reebee is celebrating Christmas with Reebee Days of Christmas contests! Each day there will be an incredible retail partner sharing amazing giveaways with the Reebee community! Today's featured retailer is Home Hardware! 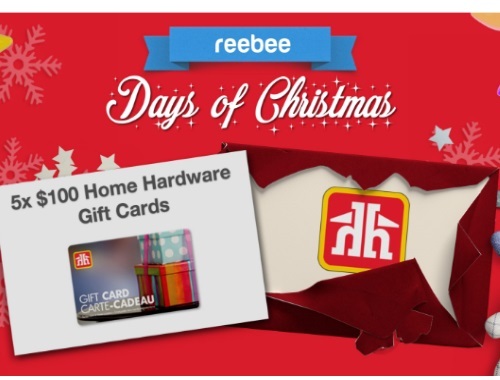 Enter at the link below, 5 lucky Reebee users will win a $100 Home Hardware gift card! Contest begins 9:00am EST Monday November 28th 2016 and ends 11:59pm EST Friday December 23 2016. The contest is divided into individual draw dates, weekends are treated as a single contest day.